Digiarty Software, Inc., the developer of Air Playit and also a multimedia software provider, today is pleased to announce the release of Air Playit HD 1.0 iPad edition especially for iPad users. From now on, this video streaming software for streaming movies and music to iPad can be downloaded on App Store. Similar to the previous edition for iPhone and iPod, this iPad edition is also free of charge to help Apple users play movies or music without video conversion and sync. According to Nielsen, "iPad still commands 82% of the U.S. tablet market despite the addition to the market of new tablet computers like Samsung Galaxy and the Motorola Xoom." So, Digiarty sped up technical research and development in conformity to the feedback of market and the demands of customers. iPad edition was made the new member of Air Playit on the basis of the original iPhone edition soon after the market summoned. This new edition will better serve numerous iPad users in a more convenient and practical way. This recently released video streaming app for iPhone, iPad, iPod touch and Android was welcomed by the users once coming into the market. Air Playit has made breakthrough by changing traditional video conversion way into live conversion so that the users can watch video in any format while converting; thereby the waiting time is saved. It also has improved the short-range operation into remote video streaming and conversion to facilitate remote movie/music acquisition and enjoyment anywhere. Air Playit is composed of 2 parts: App Client for iPhone and iPad, and an Air Playit Server for computer. They can be free download at the homepage. 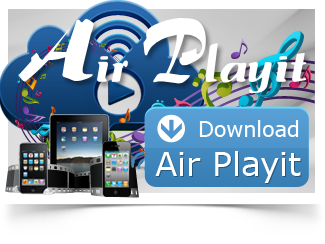 Air Playit is applicable to both Windows and Mac OS. With 320 built-in video/audio codecs, this personal audio video cloud is capable of streaming almost all videos and audios to iPhone iPad iPod. * Video: wirelessly streaming both HD and regular videos including MKV, M2TS, AVCHD, MPEG1/2, WMV, ASF, AVI, etc. to the mobile devices via WiFi and 3G/4G network, supporting 1080p/720p or multi-track videos, and allowing user to adjust resolution and quality. 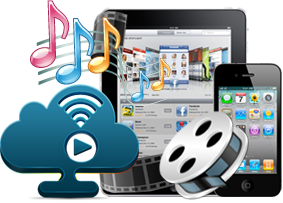 * Music: Streaming MP3, AAC, AIFF, WAV audios to iDevice over WiFi, 3G/4G from computer to update the music library of user without sync. Air Playit also supports offline conversion to convert videos remotely for offline playback and Apple TV-Out to stream video and music to TV via iPhone or iPad. Air Playit HD 1.0 is free and available worldwide exclusively through the App Store in the Utilities category.